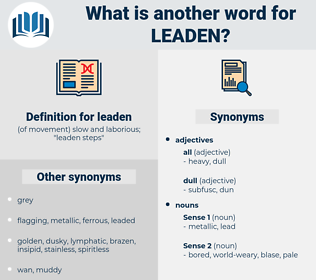 What is another word for leaden? ( of movement) slow and laborious; " leaden steps"
beguiling, spellbinding, mesmerizing, breathtaking, rich, awesome, energizing, polychrome, motley, stimulating, animating, amazing, gripping, polychromatic, thrilling, moving, invigorating, marvelous, exhilarating, astounding, sensational, spectacular, astonishing, provocative, colored, suspenseful, surprising, riveting, hair-raising, stirring, varicolored, absorbing, wonderful, fabulous, clear, rip-roaring, exciting, deep, engrossing, rousing, touching, electrifying, colorful, effortless, multicolored, variegated, galvanizing, chromatic, inspiring, arresting, intriguing, interesting, tantalizing, enlivening, enthralling, eye-opening, wondrous. When not under the influence of the drug everything looked dull, leaden, and hopeless. The oars were gladly drawn in, and the spirits of the men rose as the little boat bent over to the blast, lost her leaden qualities, and danced upon the broad - backed billows, like a cork. 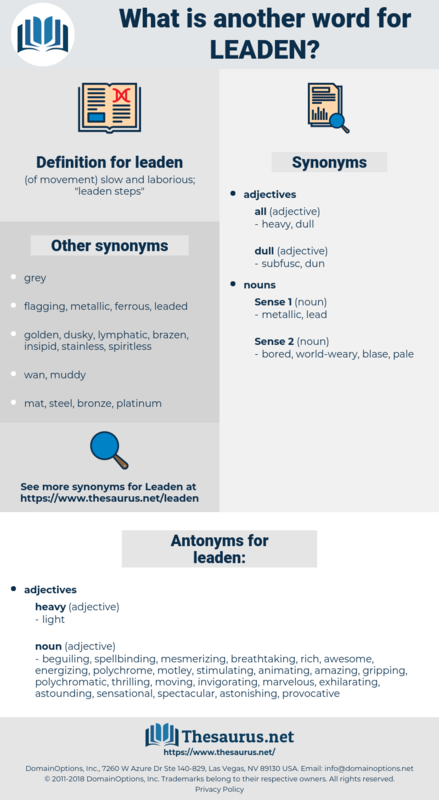 latino, ludian, louden, lithotomy, lodine, load down, low-down, lotion, lead time, loaded down, lytton, lateen, lithium, latten, lutein, Low Latin, let in, lead on, lutetium, lithane, laotian, lithuania, letdown, lay down, lawton, laudanum, ledum, LTM, latona, latium, lithuanian, lie down, ladanum, Ladin, lead-in, leiden, latin, lydian, ledonne, litany, let on, Ledden, leyden, laden, lallation, let down, Ladino.